Water gardens offer a touch of romance and mystique to outdoor landscaping. 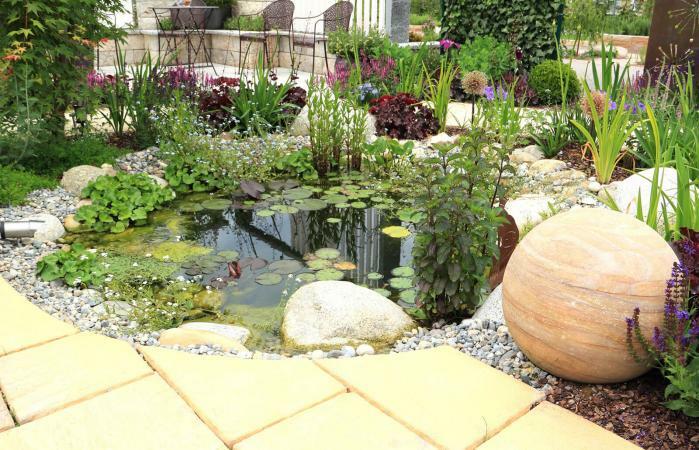 With the right aquatic plants, you can transform a plain water feature, such as a simple container or backyard pond, into a truly magical feature for outdoor enjoyment. Mosquito Fern (Azolla): This red or green, free-floating plant creates a dense mat that can rob aquatic life of oxygen. The mosquito fern prefers still water environments, such as ponds, lakes and swamps, but it can survive in slow-moving creeks/streams. Zone: 3 to 12. To date, there are no regulations prohibiting its use. 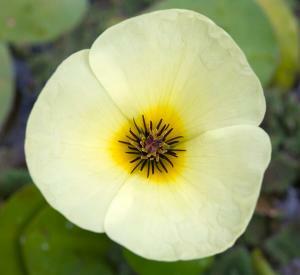 Water Poppy (Hydrocleys nymphoides): This popular pond plant has a lily appearance and spreads quickly providing yellow summer blooms. 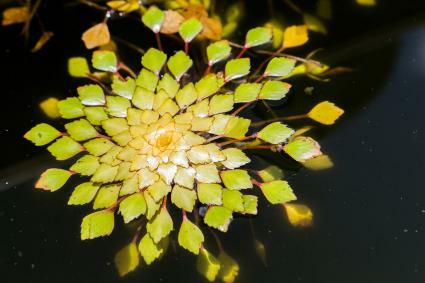 Both the leaves and flowers stand slightly above the water. The plant can grow in four to 12 inches of water and requires full sun, but it can live in partial shade. Zone: 9 to 11. To date, there are no regulations prohibiting its use. American frogbit (Limnobium spongia): This water plant either floats or grows rooted in the mud. Found throughout Florida, it generates a dense mat that threatens other plants and fish. The bright, shiny, leathery-like leaves are round and heart-shaped. Grows in zones 6b to 10. Currently, it is only regulated or illegal in California and Pennsylvania. Many plants can easily grow along the edge of the water submerged a few inches. For a small backyard pond, use containers with aerating holes on the sides and bottom to prevent the plants from taking over the entire pound. 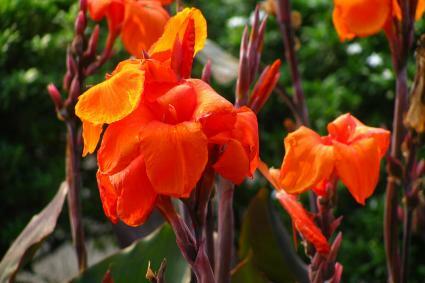 Canna (x generalis): Often overlooked for water gardens, canna lends a tropical ambience. 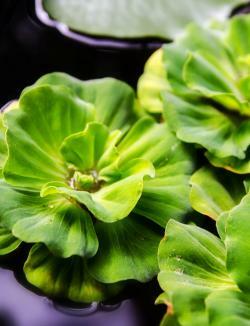 This plant can be used along the edge of a pond or submerged in a container garden. Full sun is needed. It can grow up to 10 feet tall, so plan to accommodate its height when designing your water garden. Zone: All. 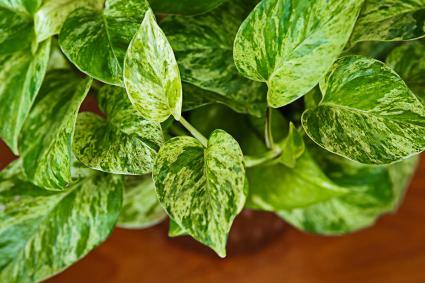 Golden Pothos: This shade-loving plant is gold and green variegated and a favorite, since it'll grow in soil or water. Once rooted, golden pothos cares for itself. It can grow up to 40 feet in length, making it a prolific ground cover. It roots very easily whenever it comes in contact with dirt or water. This makes it a potentially invasive plant, if left unchecked. It often climbs up trees when allowed to grow without any controls in place. Susceptible to aphids and mealybugs. It is toxic if ingested by humans, dogs, or cats. The sap causes irritation to skin and eyes. Zone: 10 to 11. 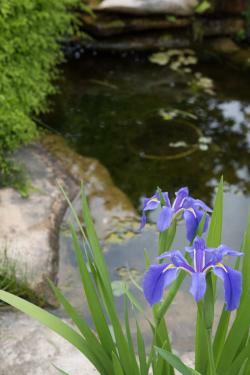 Louisiana Iris (Iris fulva): The yellow or red flowers thrive pond side. It prefers full sun but can tolerate partial shade. It can be grown in no more than six inches of water and reaches three feet tall. Best grown in a container if submerging in water. Zone: 5 to 9. You my want to consider plants that grow underwater. Submerged plants are oxygenators and can provide needed oxygen to all aquatic life. However, some species are overly zealous and can threaten to overpower native species if not contained. 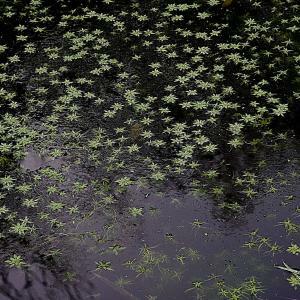 Water starwort (Callitriche stagnalis): This water herb found in wetlands typically grows underwater. A few of its egg-shaped leaves sometimes cluster to the surface. Its flowers are very small. Some regions consider this plant an ecological threat to native species, while states like South Carolina recommend it as an oxygenator to grow in a submersible container. 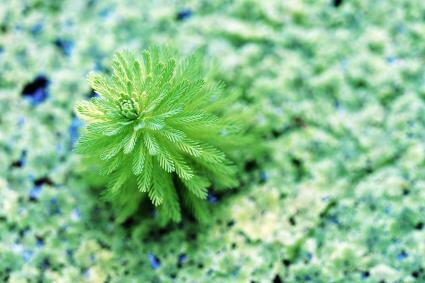 Parrot's feather (Myriophyllum aquaticum): Clemson University recommends this submerged aquatic plant as an oxygenator that should be planted in a container. However, Michigan prohibits its use, citing it's an invasive threat to native species, as well as providing a habitat for mosquito larvae. 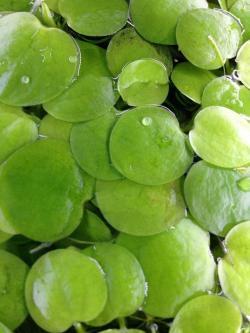 Some water plants are also edible. You may be interested in using these to expand your food growing endeavors. Lotus plants: The seeds, leaves, and root tubers of the prolific lotus plant are used throughout Asian cuisine in soups and other dishes. Floating or submerged, these plants are available in a variety of colors. Grow in a container for the best control. Grows in zone 4 to 5. This plant is regulated or illegal in Connecticut. Water chestnuts: Grow water chestnuts in containers with drainage in the sides and bottom in shallow water. The corms can be harvested for stir-fries and other dishes. Since so many birds may take a drink from your water feature, it's very important to understand which plants your state agriculture office considers an invasive risk. 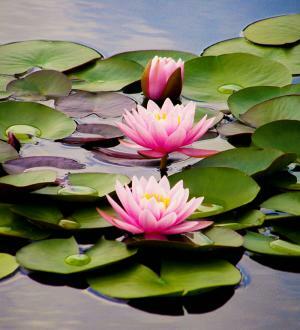 Once you decide which plants are best for your water garden, you can relax and enjoy the beauty these plants bring to a pond or other water feature.